As part of our Jubilee Celebrations we will be selling a booklet entitled A Rite Royal Bake Off. for just 50p you can buy a book with a collection of different cake recipes, all of which have a 1950’s theme! Books will be available from reception on Friday. Friday 1st June sees our Jubilee Celebration. There is a party at 12pm in the gardens, with food, games and music. Wear Red, White and Blue and enjoy this most regal of celebrations. All children are welcome to come along with their parents/carers. Everton National Conference- Are you ready for the revised EYFS? Following on from the success of our National Conference last year we are hosting another Conference. Are you ready for the revised EYFS, Tuesday 3rd July will feature a keynote speech by Helen Moylett, president of Early Education. Spaces are limited at the conference and only cost £120, including lunch and refreshments. To book download the flyer and fill in the application form or call 0151 233 1969. Calling all women! Want to keep fit then pop down to the Centre tomorrow at 9.30am. Keep fit class followed by a free breakfast! Children from 2-3’s yesterday went on an educational visit to look at fruit and vegetables. While we were there, we looked at our token box. Each shopper receives a token, to put into the ox of their choice. 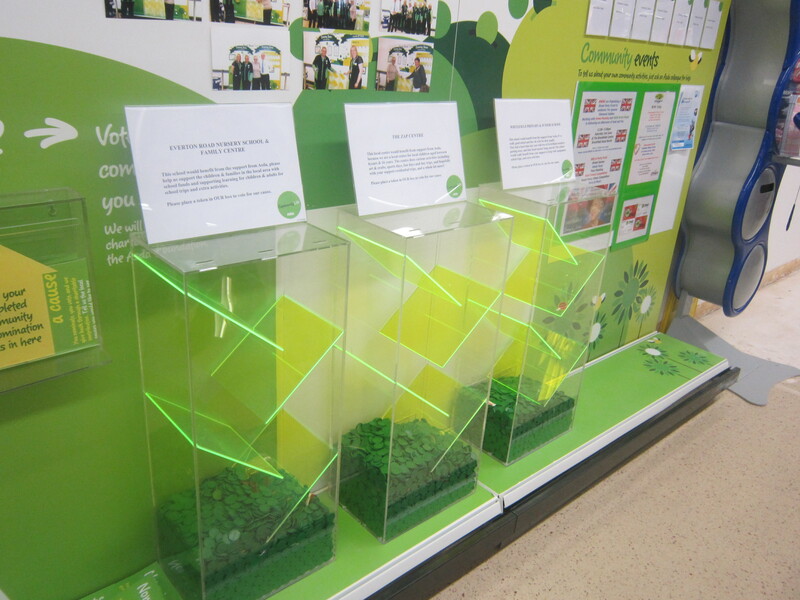 Ours is the one on the left hand side and we are winning and stand to win £200!